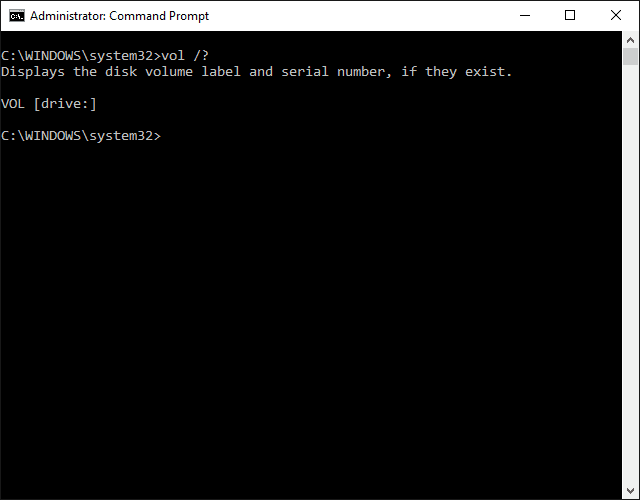 The vol command is a Command Prompt command used to display a drive's volume label and volume serial number. The dir command also shows the volume label and volume serial number of a drive before displaying the drive's contents. Also, the vol command is a DOS command available in MS-DOS. drive: is the letter of the drive that you want to view the volume label and volume serial number for. /? is the help switch with the vol command to show detailed help about the command. Executing vol /? is the same as using the help command to execute help vol. In this example, the vol command is used to display the volume label and volume serial number for the e drive. As you can see, the volume label in this example is reported as MediaDrive and the volume serial number as C0A3-A19F. Those results will differ when you run the vol command. Using the vol command without specifying a drive returns the volume label and volume serial number of the current drive. In this example, the C drive has no volume label, and the volume serial number is D4E8-E115. Volume labels are not required in any file system supported in Windows. The vol command is available from within the Command Prompt in all Windows operating systems including Windows 10, Windows 8, Windows 7, Windows Vista, Windows XP, and older versions of Windows. However, the availability of certain vol command switches and other vol command syntax differs from operating system to operating system. The volume label of a drive is necessary information for a few different commands, including the format command and the convert command. What's the More Command in Windows and How Is It Used? What Is the At Command?